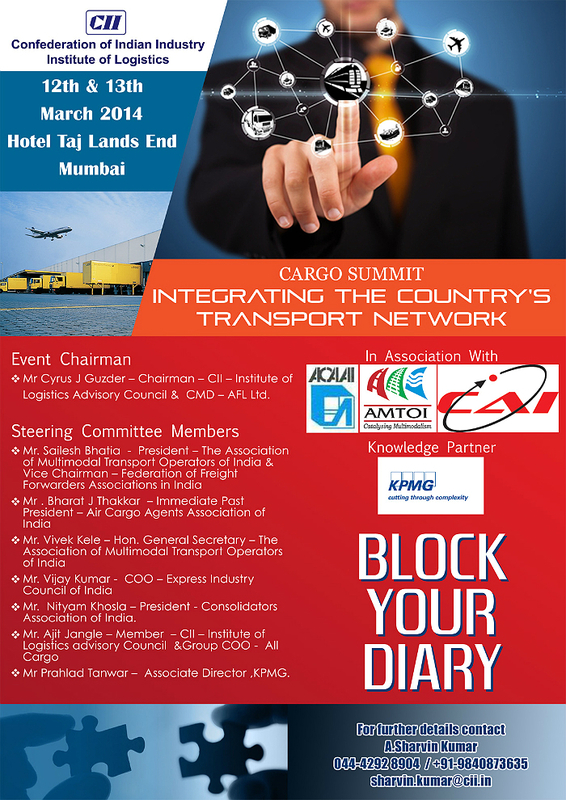 CII – Institute of Logistics is organising a two day conference on ‘CARGO SUMMIT- Integrating the Country’s Transport Networks’ in Mumbai on March 12 – 13, 2014 at Hotel Taj Lands End. This conference is focusing across verticals and providing a huge networking and knowledge sharing platform, hence the Institute is requesting the participation of stakeholders to design the new supply chain landscape for the future. Apparently, the CII – Institute of Logistics is gearing up for ‘Integrating India’s transport networks’. The CMD of AFL Ltd, Cyrus J Guzder will be the Chairman of CII – Institute of Logistics Advisory Council, while the Steering Committee Members include Sailesh Bhatia, President of The Association of Multimodal Transport Operators of India and Vice Chairman of the Federation of Freight Forwarders Associations in India; Bharat J Thakkar, Immediate Past President of Air Cargo Agents Association of India; Vivek Kele, General Secretary, The Association of Multimodal Transport Operators of India, Vijay Kumar – COO of Express Industry Council of India, Nityam Khosla – President of Consolidators Association of India, Ajit Jangle, Member of CII – Institute of Logistics Advisory Council and Group COO of All Cargo and Prahlad Tanwar, Associate Director of KPMG. DHL, the world’s leading logistics company, has been named ‘Best Employer’ in India by Aon Hewitt, a global leader in human resource consulting and outsourcing solutions. The awards are part of the Aon Hewitt Best Employers 2.0 learning conference to understand employers’ effectiveness in creating a workplace environment that engages employees and enables them to deliver real competitive advantage. DHL Express was presented with the ‘Best Employer in India’ award at a ceremony held at New Delhi’s The Oberoi Hotel yesterday, according to a company statement. 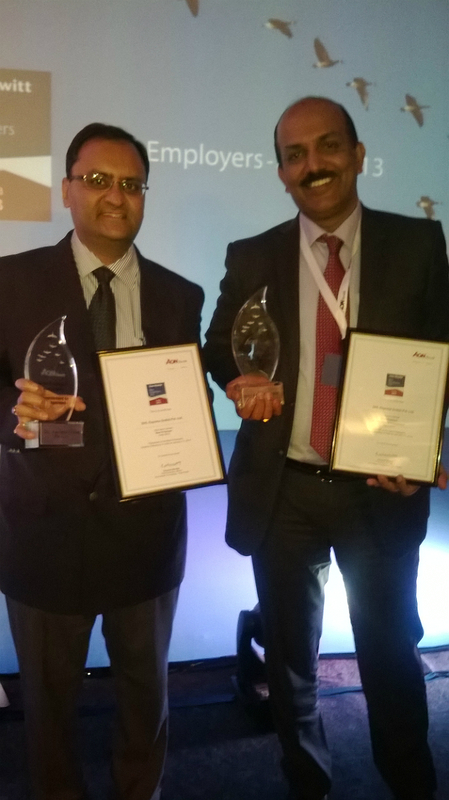 From (L-R): Sunjoy Dhavan and RS Subramanian with the ‘Best Employer Award’ by Aon Hewitt. Speaking about the achievement, RS Subramanian, Senior Vice President and Managing Director, DHL Express India, said: “We are truly delighted to be recognised as a Best Employer by Aon Hewitt. The award endorses all the work we have been doing to provide a unique DHL experience to all our employees, who are the driving force behind our business success. Being an Employer of Choice for our people is one of the three bottom lines we at DHL strive to deliver and this recognition highlights the progress we are making on this continuing journey”. Over the years, DHL has invested significantly in a number of employee enriching practices and programs including the Certified International Specialist (CIS) programme. CIS is an award-winning programme which has been instrumental in instituting a cultural transformation within DHL Express and reinforcing the company’s international market leadership. In 2010, with the aim of improving its financial position and building on its market leadership within Asia Pacific, Europe and Emerging Markets, the company announced a strategic focus on the core competence of international express delivery. In order to reinforce its international focus throughout the organization and deliver against the Employer of Choice aspiration, DHL Express launched the CIS programme globally in July 2010. The programme employs innovative learning methodologies to train employees across all functions on the fundamentals of international shipping and enhancing their knowledge of essential aspects. To date, the CIS program has been delivered to over 100,000 employees in more than 220 countries and territories worldwide, making it one of the largest corporate training programs ever implemented. The materials have been translated into 42 languages. Sunjoy Dhawan, Senior Director – Human Resources, India and South Asia, DHL Express pointed out: “With over 2,100 employees in the country, spread across 26 locations, attracting, retaining, engaging, motivating and training our people is absolutely core to us. While we invest our energy and resources in all the areas on a continuous basis, we are particularly stronger in the way we engage and train our people to strengthen organisational capability and develop a talented workforce. This is so that we have the right people with right skills doing the right jobs. We have invested in the Certified International Specialist (CIS) training which each employee goes through and Certified International Manager (CIM) training for supervisors and managers in the company. This helps in having a motivated workforce that provides great service quality to our customers and that ensures great profitability”. In 2013 DHL Express also received recognition by Aon Hewitt and won the ‘Best Employer’ in Asia Pacific award and the ‘Best Employer’ awards in Thailand, Indonesia and Korea. DHL is the global market leader in the logistics industry and ‘The Logistics Company for the world’. DHL commits its expertise in international express, air and ocean freight, road and rail transportation, contract logistics and international mail services to its customers. A global network composed of more than 220 countries and territories and about 285,000 employees worldwide offers customers superior service quality and local knowledge to satisfy their supply chain requirements. DHL accepts its social responsibility by supporting environmental protection, disaster management and education. DHL is part of Deutsche Post DHL. The Group generated revenue of more than 55 billion euros in 2012.The Aon Hewitt Best Employers 2.0 study – Asia 2013 is conducted in nine countries across Asia. These include China, Hong Kong, India, Indonesia, Korea, Malaysia, Singapore, Taiwan and Thailand. Aon Hewitt’s Best Employers study was first conducted in Asia in 2001. The 2013 study differentiates itself from previous runs and other offerings in the market by means of its professional, data-driven approach that collects data from three distinct sources: employees, HR and the CEO. In addition, an external, independent judging panel composed of reputable business, academic and media leaders is appointed to blindly deliberate and decide on each year’s list of Best Employers. DHL, the world’s leading logistics company, along with Blue Dart, South Asia’s premier courier and integrated express package Distribution Company, part of the DHL Group, has conducted a four-day emergency relief simulation course in Bangalore, India with close to 40 volunteers from DHL’s Disaster Response Team (DRT). According to a statement issued by the company, this training is part of the company’s Corporate Responsibility programme ‘GoHelp’, which covers disaster relief and disaster prevention issues. The DRT will manage the logistics of the inbound relief goods sent via air or sea by the international community and help ensure the quick and constant flow of goods to the people in need. Carl Schelfhaut, Head of International Relations and Disaster Management Asia Pacific for Deutsche Post DHL, said: “Our DRT trainings regularly take place in disaster-prone regions worldwide, including various exercises like warehouse management, appropriate treatment of sensitive goods like medicine and food, as well as teambuilding and physical tasks to ensure our volunteers are able to support relief efforts in the aftermath of a natural disaster. Our recent deployment in Cebu to manage the logistics of relief goods following the devastation caused by super typhoon ‘Haiyan’ is testament to the effectiveness of our trainings to ensure smooth processes under difficult environmental conditions during a deployment”. “The newly trained team in India comprises about 40 employees who have volunteered from across the country. This DRT training can now provide effective airport logistics support to humanitarian relief operations in India and are now on call 24 hours a day, ready to quickly create a logistics infrastructure at airports. Given the vast number of incoming relief supplies which arrive at airports following a natural disaster, the expertise of the DHL and Blue Dart employees will play an extremely important role in setting up a functioning logistics operation at the airport,” Schelfhaut added. 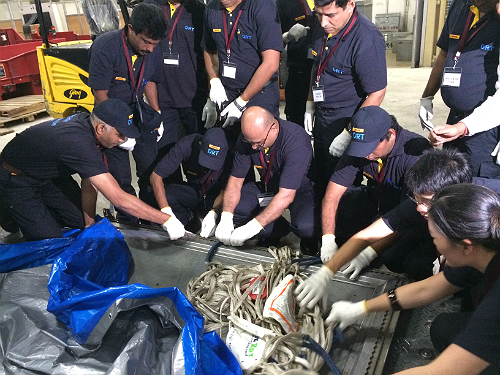 The team is also trained to pack and dispatch the DHL speedballs, an innovative disaster relief solution designed to deliver aid to inaccessible areas for example in flooded areas. 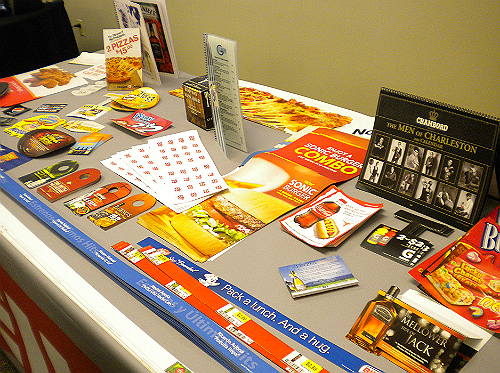 The speedballs contain basic supplies like food, water and hygiene items. These supplies are packed into DHL courier bags, robust enough to be dropped by aircraft and capable of holding up to 25 kg of relief supplies. As part of the strategic partnership with the UN Office for the Coordination of Humanitarian Affairs (OCHA), DHL has established a global network DRTs, which support airports in case of a disaster. The DRTs provide logistical support free of charge for the speedy movement of relief supplies, including unloading cargo planes, conducting professional warehousing and inventory management, as well as loading the relief goods for onward transportation. The DRT network consists of over 400 trained DHL volunteers, who can be deployed within 72 hours. DRT teams deploy for up to three weeks at a time, with up to 10 employees making up a single DRT. Since 2005, the DRTs have been deployed more than 20 times worldwide, most recently to the Philippines in the wake of the devastation wrought by super typhoon ‘Haiyan’. DHL has signed MOUs with several countries in disaster-prone regions to provide the services of DRTs, allowing governments to request support directly and accelerating DRT deployments. As part of its GoHelp programme, DHL also runs a disaster preparedness program called ‘Get Airports Ready for Disaster’ (GARD) with partner United Nations Development Program. GARD trains airport personnel and staff from disaster management agencies for the logistics challenges posed by natural disasters and their aftermath. It was launched in 2009 and piloted successfully in disaster-prone Indonesia. It has since been rolled out in Nepal, Bangladesh, Lebanon, the Philippines and Turkey. DHL is the global market leader in the logistics industry and ‘The Logistics Company for the world’. DHL commits its expertise in international express, air and ocean freight, road and rail transportation, contract logistics and international mail services to its customers. A global network composed of more than 220 countries and territories and about 285,000 employees’ worldwide offers customers superior service quality and local knowledge to satisfy their supply chain requirements. DHL accepts its social responsibility by supporting environmental protection, disaster management and education. DHL is part of Deutsche Post DHL. The Group generated revenue of more than 55 billion euros in 2012. InfodriveIndia.com, India’s premier research company in export import market research, announced yesterday that India’s Printed Books, Newspapers, Pictures and other products of the Printing Industry exports in November- 2013 has grew to $ 340.26 million, a increase of 27.75 percent compared to October 2013. This finding is based on India Printed Books, Newspapers, Pictures and other products of the Printing Industry export data of InfodriveIndia.com and is based on export shipping bills filed at Indian customs by exporters from India through November- 2013 at more than 110 ports in India like JNPT, Bombay Air and Sea, Chennai Air and Sea, Delhi IGI Air, Delhi Tughlakhabad ICD, Delhi Patparganj, Kolkata Air and Sea, Bangalore Air and many more. InfodriveIndia.com India Printed Books, Newspapers, Pictures and other products of the Printing Industry Export database is considered to be the most comprehensive, up-to-date and authentic information on India’s foreign trade of Printed Books, Newspapers, Pictures and other products of the Printing Industry, according to IndiaPRWire. A. Exports of Unused Postage Revenue or similar Stamps of Current or New issue in the Country has grew month on month basis by 36.99 percent. Total value of exports in November- 2013 was 315.45 million, compared to October 2013, there is a increase of 85.17 million in November- 2013, growth rate in percentage terms is 36.99 percent, the major destination countries were United Kingdom, Switzerland, United Arab Emirates, Bahrain and austria and major Indian ports were Delhi Air, Bombay Air, Cochin Air, Madras Air and Madras Sea. B. Exports of Printed Books, Brochures, Leaflets and similar Printed Matter has fallen month on month basis by -25.39 percent. Total value of exports in November- 2013 was 21.54 million, compared to October 2013 , there is a decrease of -7.33 million in November- 2013, growth rate in percentage terms is -25.39 percent, the major destination countries were Djibouti, United States, Mozambique, Nigeria and United Kingdom and major Indian ports were JNPT, Dadri-ACPL CFS, Delhi TKD ICD, Mundra and Delhi Air. C. Exports of Printed Products including Printed Pictures and Photographs has fallen month on month basis by -35.05 percent. Total value of exports in November- 2013 was 1.5 million, compared to October 2013, there is a decrease of -0.81 million in November- 2013, growth rate in percentage terms is -35.05 percent, the major destination countries were Burkina Faso, Belgium, Madagascar, australia and Tanzania and major Indian ports were Madras Sea, Delhi Air, JNPT, Bombay Air and Bangalore Air. D. Exports of Calendars of any kind Printed has fallen month on month basis by -39.39 percent. Total value of exports in November- 2013 was 0.43 million, compared to October 2013 , there is a decrease of -0.28 million in November- 2013, growth rate in percentage terms is -39.39 percent, the major destination countries were Ghana, United States, United arab Emirates, Oman and Kenya and major Indian ports were JNPT, Bombay Air, Delhi TKD ICD, Madras Sea and Delhi PPG ICD. Pradeep says that the above information is on major product categories, and users requiring detailed analysis and reports on their specific products can contact Sales team at InfodriveIndia.com with detailed description of their product, brand names and its uses. According to Pradeep, usually InfodriveIndia.com team delivers most of the projects within three working days. InfodriveIndia.com analysis and research is done from export statistics from Indian customs which is based on export shipping bills filed at various ports, InfodriveIndia reporters collect this data from every Indian port, and InfodriveIndia database yields the most timely, accurate, comprehensive information available on trade through India Ports. Recently after a long and persistent lobbying with Indian Government, InfodriveIndia.com has been able to release export import data almost on realtime basis, bringing the backlog time to just three days, compared to Government sources which are around six months old. Another unique feature of InfodriveIndia.com database is unparalleled coverage of 110 ports in India. InfodriveIndia.com is 16 year old market leader and primary source of India Export data in India. The India Import Export data bank, which is at the core of InfodriveIndia.com trade information services is unique and has been categorized by Harmonis`ed system in over 25,000 product codes. InfodriveIndia researchers provide expert data analysis and interpretation tools, Charts, Pivot reports in MS Excel and detailed item wise records to support decision-marking for International Trade, understanding India export market, competitive intelligence and brand protection. World’s top market research companies, Export promotion councils, trade associations, domestic and foreign governments, and over 15,000 corporates from more than 30 countries rely on InfodriveIndia.com for meaningful export import trade intelligence to guide their International business strategies. Many of the development efforts to improve the capabilities of various types of transport in India will lead to a transformation in transportation modal mix for logistic users, says the Frost & Sullivan analysis. Apparently, this shift is expected to favour the railways, which is already a popular mode of transport for freight movement owing to its cost advantageous, despite stumbling blocks including perennial delays, elaborate procedures and inefficient connectivity. The analysis finds that the railways’ cost-effectiveness in long-distance, high-volume cargo movement has ensured it remains a preferred mode of transport for logistic companies. In fact, rail transport is likely to gain transportation share at the cost of the road mode by 2017. The latter’s share is expected to decrease by around six percent. ‘With rising containerization and the development of dedicated freight corridors, the rail mode presents an ideal blend of capacity and cost-efficiency,’ A Frost & Sullivan Automotive and Transportation Analyst said. “Schemes such as freight discounts and incentives is expected to encourage private participation, along with procedural improvements through the use of the Internet, which will sustain the popularity of rail transportation”, he pointed out. Logistic service providers are looking to acquire multimodal capabilities to cater to end users that increasingly demand integrated transport solutions. Various projects promoting multimodal transportation, such as the construction of roads linking ports to the highway network, are expected to positively impact the Indian rail transportation industry. While multimodal transport solutions are possible, insufficient connectivity to every corner of the country restricts the railways to being an independent mode for moving consignments. What is more, the lack of integration with most other transport modes, limits the scope of rail use only to long-distance cargo movement. “Therefore, developments in the country’s logistic infrastructure, including the construction of container rail terminals, logistics parks and railway links with Indian sea ports, are critical for better connectivity and reliability. These expansions will persuade end users, particularly those dealing with large container volumes, to sway in favor of rail transport and use roads for just first and last mile connectivity”, the analyst further pointed out. Grants for customers that bring high-value and high-volume business will further promote the railways as an attractive mode for goods transportation in India. Transportation Modal Shift in India and its Impact on Rail Logistics is part of the Transportation & Logistics Growth Partnership Service programme. Frost & Sullivan’s related studies include: Eighth Annual Indian Logistics Industry Benchmarking Study, Opportunities in Outsourced Logistics in India, IT Spend and Trends in Indian Logistics Market and Logistics Scenario Tracker on Indian Pharmaceuticals Industry. All studies included in subscriptions provide detailed market opportunities and industry trends evaluated following extensive interviews with market participants. The International Air Transport Association (IATA) Airline Industry Forecast 2013-2017 revealed that international freight volumes are expected to grow 17 percent over the next five years, according to an official statement. This consensus outlook incorporates a conservative estimate of the recovery in global economic activity and world trade volumes over the coming years. 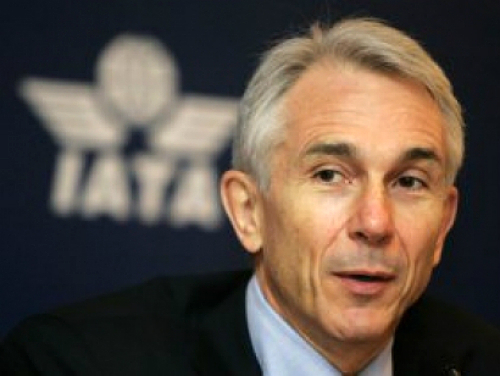 Tony Tyler, IATA’s Director General and CEO said: “Air cargo is a key enabler for the movement of high value products and perishable goods around the globe. More than $6 trillion worth of goods is air freighted annually, accounting for around 35% of total world trade. But more recently, the relationship between international trade and GDP has broken down owing to rising trade barriers and ‘on-shoring’ of production. The successful conclusion of the World Trade Organization talks in Bali potentially could be very important in kick-starting trade growth. To be ready to take best advantage of possible opportunities, air cargo needs to work together as an industry to improve its competitiveness and enhance the quality of its service to customers”. • Europe-Asia Pacific and North and Mid-Pacific are both expected to be down by around 0.3 percentage points in 2017 compared with 2012. Safeducate, a specialist in supply chain and logistics training, has unfolded major plans to bridge the massive skill gaps present in the Indian supply chain & logistics industry, according to a statement released by the company. 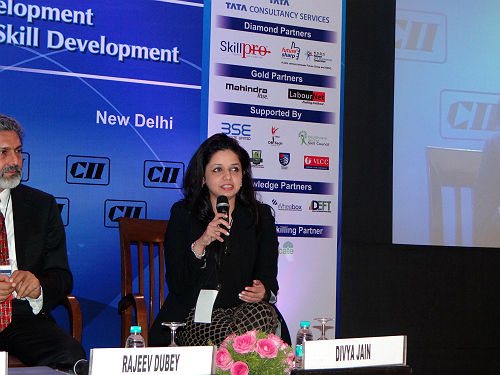 Safeducate was ‘Supply Chain Skilling Partner’ in the CII National Conference on Skill Development 2013 at Hotel Lalit, New Delhi on November 28, 2013. Many eminent speakers from the industry were present in the conference to share their views on the requirement of good quality manpower for better economic growth of the country. These included Som Mittal, President – Nasscom, Rajeev Dubey, President – Group HR, Corporate Services and Aftermarket, Mahindra & Mahindra; S Mahalingam, Chairman – CII National Committee on Skill Development and Divya Jain, CEO, Safeducate. Sharing her views with the audience on this occasion, Jain said: “Supply chain and logistics industry is the backbone of the Indian economy. The three biggest challenges facing this industry include poor infrastructure, regulatory bottlenecks and lack of skilled manpower. While the first two challenges are huge, lack of skilled manpower has become a very central issue which almost every organization in this field is facing on an everyday basis. Supply chain and logistics industry is one of the largest employment generators in the country. However, there is a big mismatch when it comes to availability of quality manpower in this industry due to lack of formal education and overall industry perception. Since it is a people-intensive industry, therefore availability of quality manpower is extremely vital for the success of this industry”. “Safeducate has been working towards bridging the huge skill gaps prevalent in the Indian supply chain & logistics industry. Given the industry domain knowledge that we possess, it is imperative that we do our bit for the industry, by way of imparting quality education, which has a right balance of theoretical and practical training in the various supply chain & logistics functions. We are also in the process of tying up with various premier educational institutes to create specialized MBA programs in supply chain & logistics. Our initiative will help in creating trained professionals, which in turn would help to overcome the challenge of scarcity of skilled manpower in the supply chain arena and this would help in boosting the growth of industry”, she added. Jain is the founder and CEO of Safeducate, India’s premier supply chain training institute. Safeducate is a CILT (Chartered Institute of Logistics and Transport) accredited institute and offers vocational and diploma courses for supply chain employability. She is spearheading Safeducate, and is leading a competent team of trainers who continuously strive towards developing a talent pool of proficient supply chain and logistics professionals. Safeducate has trained over 20,000 people since its establishment in 2007. She understands the Indian supply chain industry very well and is able to identify the skill requirements at each operating level to ensure that the learning and development programs get the right-skilled individuals as per industry needs. She has also co-authored ‘Horn Please’ – a book focusing on the trucking profession in India. Divya Jain has a graduate degree in BA (Honours) Economics from Hindu College (Delhi University), and a Masters in Management from Cambridge University (UK). She also has a Law Degree (LLB) from University of London. Safeducate, a specialist in supply chain and logistics training, was established in 2007, with an aim to meet the continuously evolving needs of the workforce of the supply chain and logistics industry of India. Led by the alumni of Stanford and Cambridge University, the team blends rich operational experience of the supply chain arena with international know-how and best practices to create programs which are extremely stimulating, hands-on and practical. Safeducate is backed by a team of highly experienced consultants and trainers. These professionals offer world-class training as a part of uniquely designing programmes and courses, through which participants are able to gain extensive supply chain and logistics understanding. The participants are provided with comprehensive domain knowledge and practical training, enabling them to face day-to-day challenges of working in supply chain and logistics industry. Having state-of-the-art learning centers across the country, Safeducate intends to revolutionise the supply chain education arena with its profound knowledge, experience and expertise in the field. 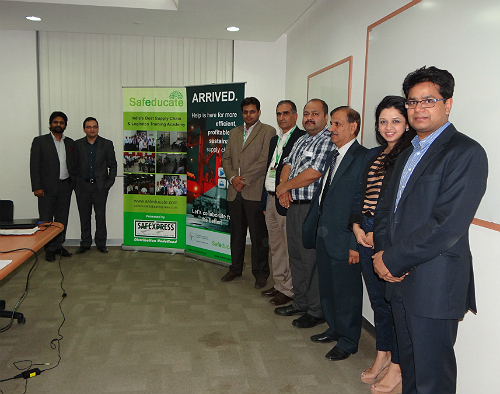 Safeducate has achieved a landmark of training more than 20,000 people across 52 cities in India. All the training programmes offered by Safeducate are CILT (Chartered Institute of Logistics and Transport) accredited, and follow global standards in supply chain and logistics education. Safeducate, a specialist in supply chain and logistics training, recently launched the Safeducate–CILT Learning Forum at their Corporate Office in New Delhi. More than 25 eminent representatives from the industry were present, according to a company statement. On this occasion, Divya Jain, CEO, Safeducate said: “The idea behind this initiative is to encourage meaningful dialogue between senior professionals from supply chain and logistics industry about the various issues prevailing in the industry. This forum helped in creating a platform for these industry professionals, where they could share their expertise in tackling various challenges associated with the industry. It ended up being a fantastic learning opportunity for everyone. Going forward, this initiative will provide a strong base to the industry people to voice their concerns, and come up with feasible and long-term solutions to address the technological, administrative and infrastructural challenges within the supply chain”. The participants in the event included senior representatives from CILT India (The Chartered Institute of Logistics and Transport), Bird Group, Freight Forwarders Association of India, Inter India Group, TCI Supply Chain Solutions, Agarwal Packer and Movers, SKF India, among others. 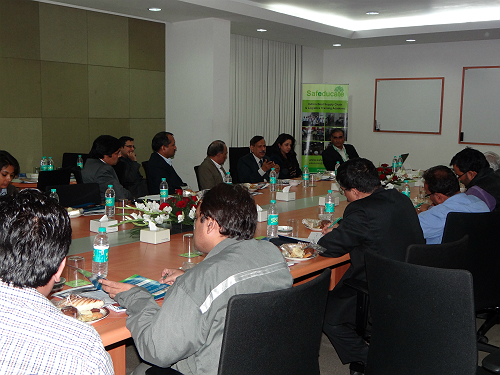 speakers included Ritesh Bhatia, Business Partner – Brattle Foods and Naresh Jawa, Managing Partner – Fresh Supply Chain. The topics for the discussion in the forum included ‘Best Practices in Logistics’ and ‘Integration of services’. The speakers suggested that the best practices are always a balance between the feasibility of design and challenges of implementation. Divya Jain concluded: “This forum will now be a monthly affair, wherein the turnout from the industry is expected to grow significantly and Safeducate will extend its support for more of such forums which would serve the industry cause”. Safeducate is backed by a team of highly experienced consultants and trainers. These professionals offer world-class training as a part of uniquely designing programs and courses, through which participants are able to gain extensive supply chain & logistics understanding. The participants are provided with comprehensive domain knowledge and practical training, enabling them to face day-to-day challenges of working in supply chain and logistics industry. Having state-of-the-art learning centres across the country, Safeducate intends to revolutionize the supply chain education arena with its profound knowledge, experience and expertise in the field. Safeducate has achieved a landmark of training more than 20,000 people across 52 cities in India. All the training programmes offered by Safeducate are CILT accredited and follow global standards in supply chain and logistics education. 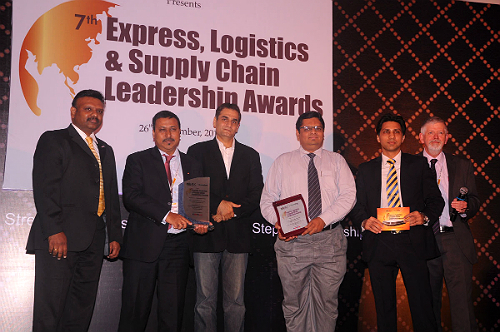 Schenker India Private Ltd, a leading provider of integrated logistics services in the country, has won the prestigious ‘Best Freight Forwarder of the Year – 2013’ award. According to a company statement, the award was conferred at the seventh Express Logistics and Supply Chain Conclave held on September 26, 2013 at the Taj Lands End in Mumbai. This is the third consective win for the leading logistic provider, noted the statement. From (L-R): Joshua Ebenezer – National Head of Customs and Trade Compliance, Schenker India; Shubhendu Das – Chief Operating Officer, Schenker India; Hitendra Chaturvedi – Founder and Managing Director, Reverse Logistics Company; Mayur Gandhi – Chief Financial Officer, Schenker India; Capt Dushyant Berry – National Head – Ocean Freight Product Development, Schenker India and Andrew Downard, MD, AD Supply Chain Group Pty Ltd. The award was conferred by Kamikaze B2B media, one of the largest information companies in field of transport and logistics industry in India. An Independent research agency ‘Leap Ridge Consultants LLC’ was accredited with the research for the award nominees and winners for 2013 Express Logistics and Supply Chain Awards. Reflecting on this special development, Shubhendu Das, Chief Operating Officer, Schenker India said: “Schenker India is a customer focused firm and it is evident in our wide range of freight solutions for customers. The company stands for reliability, transparency and on-time delivery. The award, our third consecutive win, underscores not only our leading role in freight solutions, but also the high degree of customer orientation of our services. We thank the jury for the recognition and honour”. Schenker India is one of the leading providers of integrated logistics services in the country. It offers a complete range of international air and ocean freight, contract logistics and global supply chain solutions from a single source. With 36 offices and more than 53 warehouses covering more than 1.3 million of warehousing space, Schenker India enjoys an enviable position to seamlessly serve its customers from any part, at any time. 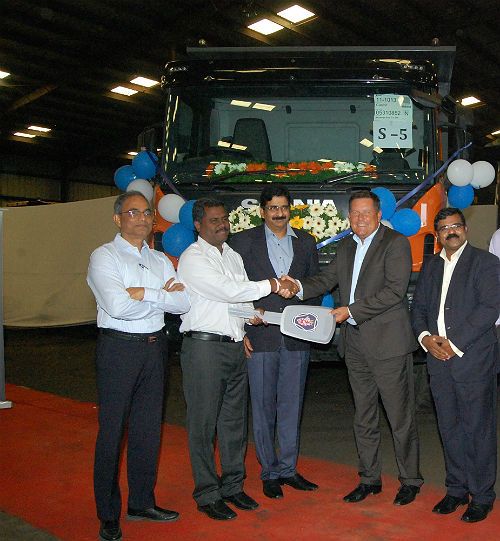 Scania Commercial Vehicles India recently delivered 60 trucks to one of the largest private port operators in the country, Krishnapatnam Port Company Limited (KPCL), making this a new business model ever, for the auto maker in India. The trucks included the recently launched Scania P 410 8×4, the most powerful 8×4 tipper in the coal transportation tipper segment. This truck is powered by Scania Opticruise, an automated gear-changing system for best fuel efficiency and ease of driving, with the highest possible carrying capacity for port inter-carting of coal, according to a statement issued by the commercial vehicles manufacturer. This is a long term alliance for Scania and KPCL. What is more, Scania will set up a dedicated operating lease fleet along with a service workshop at the KPCL so as to maintain best uptime and turn around efficiencies. The truck maker will also hand over five workshop containers for service on site backed by driver training centre at the port to ramp up the operations. 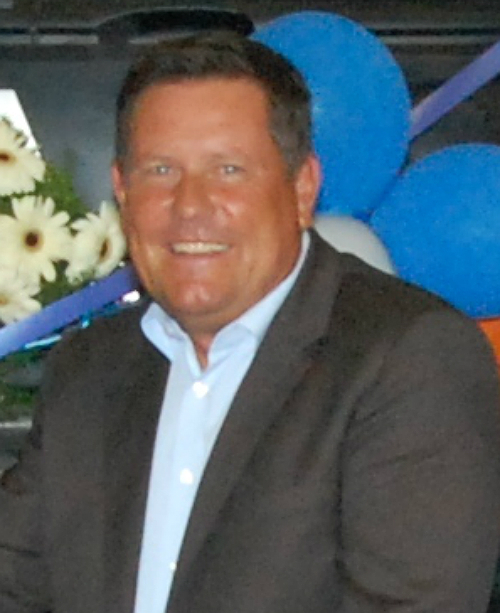 Anders Grundströmer, Managing Director, Scania Commercial Vehicles India and Vice President Scania Group, informed: “This is a very proud moment for us.This is proof of the confidence that customers in India have in us. KPCL has chosen Scania as its transportation partner and we are sure that over time they will see the benefits of a lower TCO”. 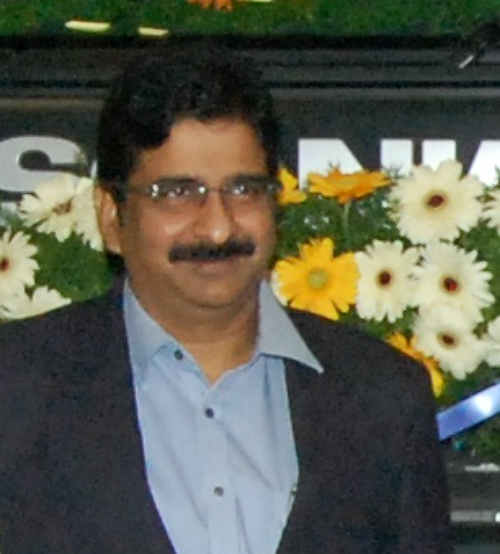 Anil Yendluri, Chief Executive Officer, KPCL opined: “This is an important association for us as Scania offers cost-effective transport solutions which directly impact our business. We are very excited to be associated with Scaniaandare happy to unveil Scania’s P 410 8×4 in India. We strong believe that Scania will help improve our profitability and look forward to a mutually beneficial relationship. We are also working with Scania on other significant areas such as logistics and transportation solutions for LNG (Liquefied Natural Gas) and container transportation”. KPCL was formed through a mandate from the Government of Andhra Pradesh to develop the existing minor port into modern, deep water and high Productivity port, on Build–Operate-Share-Transfer concession basis for 50 years. The KPCL is being built in three phases. Post the completion of the first phase in a record time of 18 months, Krishnapatnam Port was dedicated to the nation on July 17, 2008. At present, the second phase of development is underway. The port has humungous strengths including its area, location, weather and the credentials of CVR Group that is promoting this port, KPCL is set to become one of the biggest ports in the world. Scania is aiming at an annual production of 2,500 heavy haulage trucks and 1,000 inter-city multi-axle buses and coaches from the plant within five years. The first truck is was rolled out of the assembly line in April 2013. The Narasapura manufacturing plant near Bangalore is likely to improve Scania’s fortune by enhancing sales and service offering, thus bringing in a wider selection of models and reduce delivery times. Scania is investing about Rs 2.5 billion in an industrial facility in Bangalore. The Scania Regional Product Centre India will also be the hub of the Scania’s commercial operations in the country. The truck maker’s ambition is to sell about 2,500 trucks, 1,000 coaches a year in the Indian market within the next five years. The manufacturing plant is being constructed in an industrial area 40 km east of the city, the capital of the south Indian state of Karnataka. Production has commenced from June this year. It is estimated that almost 800 people will be employed at the facility in the longer term. The industrial operations will consist of final assembly of trucks with bodywork and building of complete coaches with bodywork. The head office of Scania’s Indian company, complete with a service workshop and a central parts warehouse, will be housed at the same site. Scania has been represented in the Indian market since 2007, when a partnership was initiated with Larsen & Toubro (L&T). L&T has successfully established Scania’s trucks and services and has developed a close partnership with customers in the mining industry. L&T currently operates about 10 Scania service workshops at various mining sites in the country. In 2011, Scania established the entity, Scania Commercial Vehicles India in order to boost its presence through sales to additional segments of the Indian commercial vehicle market. Scania recently launched a new range of on-road haulage truck models specially adapted for the Indian market – the R 500 6×4, the G 460 6×4 and the P 410 6×2. The P 410 8×4 mining tipper was launched in December 2012. In the beginning of 2013 Scania launched a new coach range, specially for the Indian market. The new coach range is offered in three models and is a purpose-designed coach for luxury intercity or charter travels. In June same year Scania launched engines for industrial, marine and power generation in India.